Challenges of a sloping football pitch. The life of a local football club groundsman can be a difficult task and one of many challenges. Faced with battling the wind and rain to limit postponements, ever tightening budgets, arriving first on match days to mark out the pitch, last to leave as you have to take down the nets and all to provide a surface that the players can turn up, play 90 minutes on and then head to the bar for a post-match pint. The installation of goal posts on a nice level playing field should be a simple enough task if you follow the installation instructions provided. Once installed the underside of the crossbar will be 2.44m from the surface of the pitch at both uprights and centre of the goal. Add into the mix however a pitch with a severe left-to-right slope and the ease of erecting a new set of goal posts becomes a much more challenging proposition. Many people in this situation assume that the crossbar should follow the gradient of the slope, however in our opinion this is in fact incorrect and unachievable. Goals Installed in this way will not only result in a sloping crossbar but with the uprights leaning also, providing both an unsightly and unstable goal. 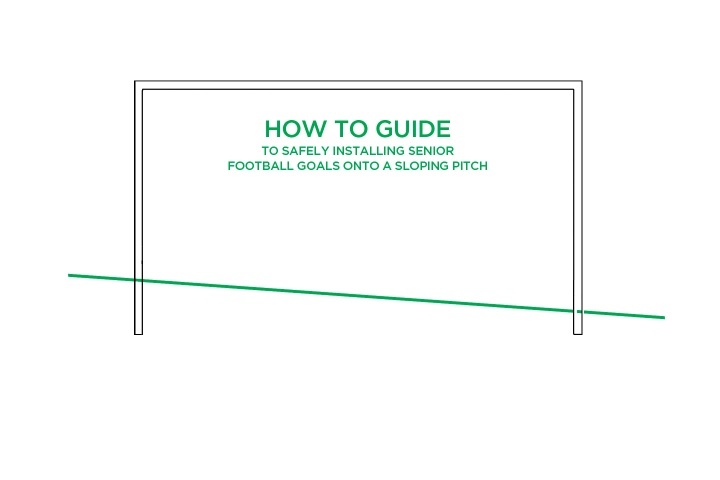 As levelling a whole pitch is in most cases not an option, the most important thing to remember when installing new goal posts on an uneven surface is to ensure that the centre of the crossbar is placed at the correct height according to regulations (in the case of senior football 2.44m). The FA states that the maximum slope allowable on a football pitch should not exceed an even gradient of vertical to horizontal 1:41 in any direction. A slope of this magnitude will provide a challenge which we can hopefully make some recommendations on, however we would in every case advise that all club check with their local football association and individual league with their proposals before installing any new set of goals. 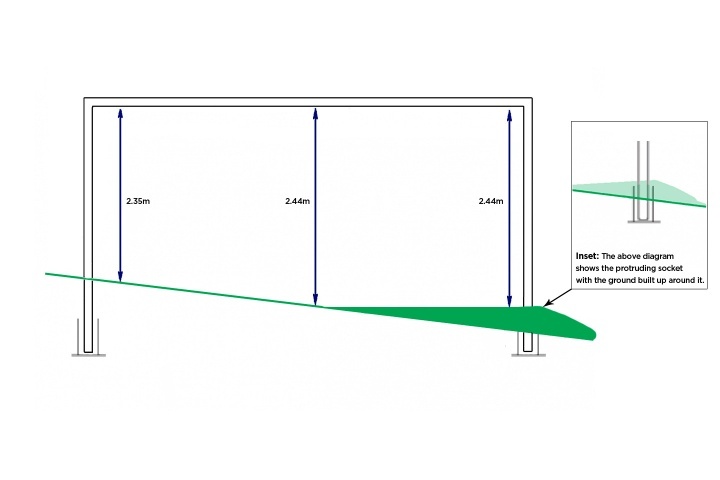 When the goalposts are installed into their sockets; we would recommend that you raise the ground within and around the goal mouth in order to provide a height at least one end and centrally of 2.44m from the underside of the crossbar to the surface of the pitch. 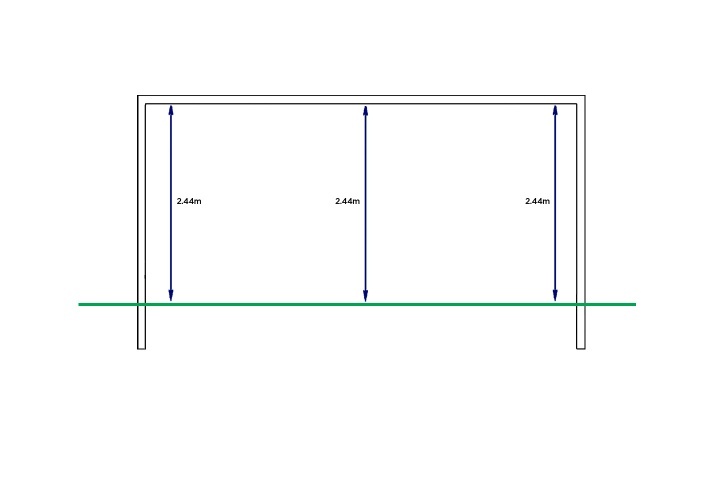 When the goalposts are installed into their sockets; we would recommend that you measure the correct height in the centre of the goal, remember to measure 2.44m from underside of the crossbar to the surface of the pitch and install the sockets so that the crossbar is level. 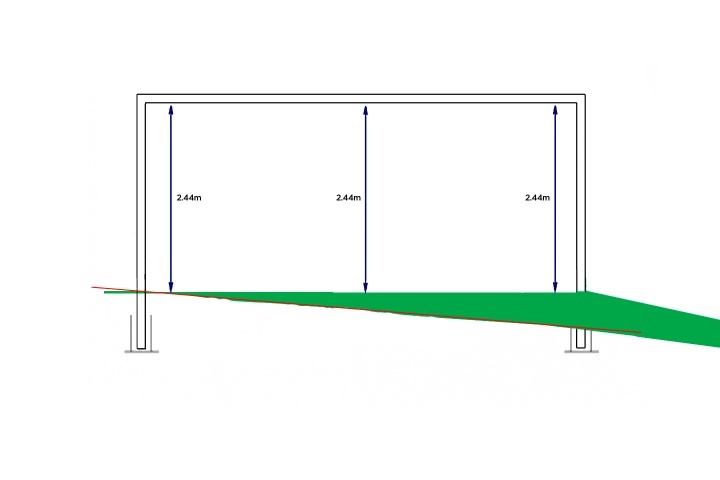 Over a 60m wide pitch with the maximum ratio of slope of 1:41 this would result in the height on the higher point being xxm and the lower end xxm. 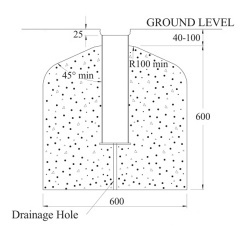 We would then recommend that you raise the ground around the socket, ensuring that the top of the socket is 25mm below the raised surface of the pitch. Whilst we fully appreciate this is by no means an easy job, this should provide a much more cost effective option than of that provided in option 1. Again we would strongly advise you seek guidance and clarification of your proposed actions from both your league and local FA before commencing any work as these are only recommendations. Please note: All sockets must be set 25mm below ground level. This is to protect lawn mower blades and to ensure there is not a trip hazard when the posts are not in situ. Therefore if a socket protrudes from the ground in order to achieve the correct crossbar height for whatever reason, then it is essential that the ground around this is built up by 25mm to encase it correctly in order to meet FA guidelines. For further information on pitch requirements or guidance on the FA National Ground Grading guidelines, please contact your local FA Regional Facilities & Investment Manager or alternatively, visit www.TheFA.com. Notes: The laws of the game do not currently cover this subject.